"Tamworth sure is a family friendly festival"
Tamworth sure is a family friendly festival, our kids love it and have been busking for the last 3 years. Together with my sisters 2 boys from Fairy Meadow near Wollongong they call themselves 'The Meadows’ and love playing and getting money to go and spend at Kmart and Target. 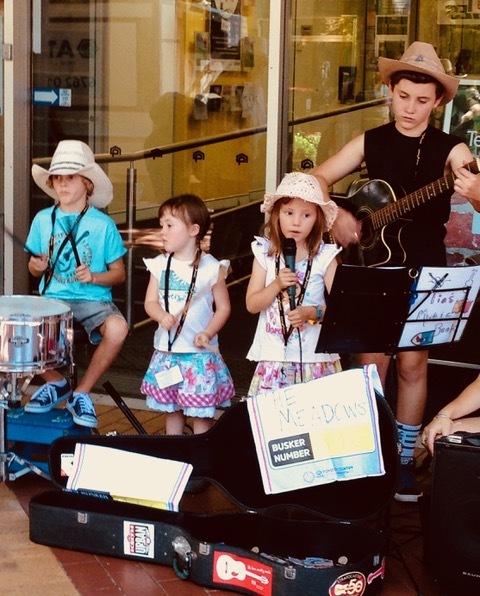 Tia surprises us each year with a new song she’s written for busking she’ll be 7 this coming Festival we’re all happy to see the kids enjoying music and our mates go and watch them…pretty cool when the big stars of the week go and support our kids. My parents (now Nan and Pop) take them busking most days doing what they did for my sister and I 30 years ago when I was 11yrs old and Beck was 13yrs old. We got into music because our folks loved it and all kinds of styles but we always loved Country music the best and would play records and go to bed listening to Country Radio Hoedown. Our grandparents had pianos and we were encouraged to play but it wasn’t until I started singing that I truly wanted to do it as a career. Growing up in Tamworth was wonderful we had music and sport to fill our days with and loads of family get togethers. The Tamworth Country Music Festival means family, being able to have a go, meet new friends and hang out with the old ones.It starts the year off with a TWANG!! !